Trade shows are an excellent vehicle to scale your business. If managed correctly, they’re cost-effective and provide you valuable face time with a targeted audience. Additionally, they’re great Centers of Influence to connect with suppliers, strategic partners and other sources for referrals. All of this is true, if you’re diligent and avoid wasting money and time. Only consider trade shows where your ideal decision-makers are likely to attend. You can make educated decisions with research. Surf online for shows in your sector. Learn about the bigger expos at Trade Show News Network. Get your customers’ opinions. Look for exhibitor information on brochures and Web sites. Take note of the participants. Ask trade show organizers for all pertinent details. See if the shows will give you a list of trade show registrants and their e-mail addresses. Your first sales steps should take place before the trade shows. Contact the registrants in advance of the trade show. Provide your value proposition, your booth location and an incentive to visit you such as a drawing for a nice prize. If possible, schedule meetings. Your signage, branding and products or services should be easily visible for attendees walking in the aisle. You can have a large banner made at your local print shop or office big-box store. You should be prepared to engage attendees within 30 seconds, as you give your handouts. Attendees appreciate free goodies. Make sure your name, Web site and contact information is on them. If you anticipate selling at expos, have sales order forms and a credit card reader. Don’t wait for trade-show attendees to approach you. Be friendly and greet people who walk by your booth. You’ll only have a few seconds to make a favorable first impression. So mention your value proposition in 10 seconds. Ask open-ended questions to get enough information from your prospects. Don’t waste time on people who aren’t likely prospects. But be very polite as you end the conversation. Your staff should be comprised solely with marketing or salespeople. 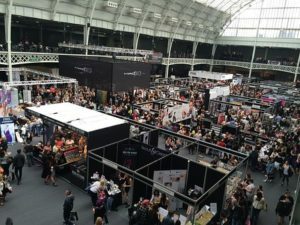 Bring enough staff so you can leave the booth and scope out other booths – your competitors, other products and vendors. You and your staff should wear the most-comfortable shoes for walking and standing long hours. Eat a good breakfast, drink lots of water, have breath mints and take breaks. Budget adequate time so you can follow up right away on your leads. A good trade show will provide you with a list of the attendees. Send an e-mail to each person. Insights for Exhibiting Success at Trade Shows — Insights include: Attendees at trade shows would rather chat with marketing and sales staff as opposed to managers. Best 11 Tips for a Super Elevator Pitch — Whether you’re looking for a job or more customers for your business, one skill you definitely need is a great elevator pitch. Here are 11 tips.